When can I use the Ultimate Compression Sock? Wear for running as well as during, and following, sporting activities to increase lymphatic drainage which removes waste products from the muscles. Wear when traveling by air, rail or road to reduce the risk of developing a DVT (Deep Vein Thrombosis). Can help speed injury recovery if your injury requires rest and inactivity. Based on UK shoe size. Ergonomic toe with left/right labelling. Padding for toe, ball and heel zones adds comfort and absorbs shock. How do the Ultimate Compression Socks work? The graduated compression technology featured on the 1000 Mile Ultimate Compression Socks reduce the build up of lactic acid and accelerate blood circulation as well as prevent muscle oscillation, minimising muscle fatigue, soreness and swelling, which allows for much quicker muscle recovery after exercise or injury. 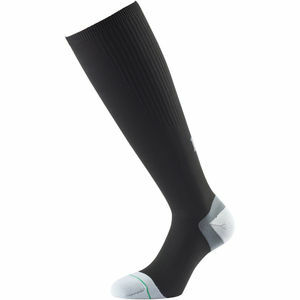 The compression socks are also made from a tactel rich wicking yarn to ensure your feet are kept cool and dry. Featuring arch and ankle bracing the compression socks provide extra support, while the padded heel, ball and toe areas with ultra flat toe seam and fitted heel ensure of total comfort. Research has shown that inactivity during travelling or enforced rest due to an injury causes blood flow back to the heart to slow. Sluggish flow of blood in these veins can contribute to a blood clot, known as a Deep Vein Thrombosis (DVT). Increasing the pressure in the veins by wearing the 1000 Mile Ultimate Compression Socks can increase venous blood flow and decrease the risk of developing a DVT. Lymphatic Drainage is the removal of toxins and waste products from the muscles and tissues. This can also be sped up due to the gentle compression of 1000 Mile Ultimate Compression Socks. This helps to improve recovery following sporting activity. 89% Nylon, 10% Lycra, 1% Polypropylene.